After the first Trustees’ meeting of 2018 we felt that a general museum update would be a great way to start off the year. We have made some great strides over the last year both, as a visitor attraction and as an organisation. We have been able to offer fantastically researched and presented tours, improved facilities to our guests in the form of a renovated cafe/shop area, and we have been able to add new exhibits to our collection with a few more to follow this year. Our membership and volunteer numbers have grown in the last year and we are thankful for all the hard work they have put in already! For this coming year we have invested in our toilet facilities by adding disabled facilities (which are almost complete), upgrading our toilet area, creating new baby changing facilities, and further updating our shop with new products. Coming out of our winter period closure, our financial position is as we predicted – stable and we are ready to build up our finances as the new season moves on to allow us to further invest in the museum. As with many volunteer-run museums, the majority of our funding comes from visitor entry fees and goodwill donations. With this in mind we remain in the black and, in contrast to previous years, have not needed to liquidate any museum assets to meet the museum’s liabilities as has been necessitated in previous years. Our 2015-16 accounts have now been finalised and are now with the Charities Commission. Unfortunately, due to questions with the accounts that required attention, our accountant was unable to complete the accounts until these particular issues were explained. As the current trustees were not in office during this period it was more difficult to promptly resolve these issues. These have now been submitted and viewable online on the Charity Commission’s website, although, due to a clerical error with the submission, our accounts have been incorrectly marked as “qualified”. This is reflected in our Accountant’s statement in our submission which gives us a good bill of financial health. In addition, the values showed on the main summary page for the Hovercraft Museum Trust show that our income and outgoings match exactly which is not accurate. This is due to the full credit and debit line totals being shown for the 2015-16 period on the summary page, whereas, it should be showing the same values less our starting and ending cash balances. Both these clerical errors are in the process of being corrected by the Charity Commission. Keep an eye on the Charity Commission’s website for our 2016-17 accounts which are to be submitted on time shortly. Visitors and members regularly ask about “The Princess Anne”, but if you are not in the know you would be forgiven for thinking they were asking about one of the Royal Family! In fact, they are talking about our largest and most famous exhibit – one of two remaining SRN4 cross-Channel hovercraft that served for over 30 years in the English Channel taking over 400 people and 60 cars at a time. Our restoration work is ongoing, mainly thanks to our SRN4 fund that has been greatly supported by the local community and people from all around the world. In the past year, we have introduced various sound effects on the craft and opened up new areas such as the lift fan bays and toilets safely by securing them with Perspex. We also had to invest in the electrical system onboard to allow adequate power for essential lighting and power tools to aid restoration. 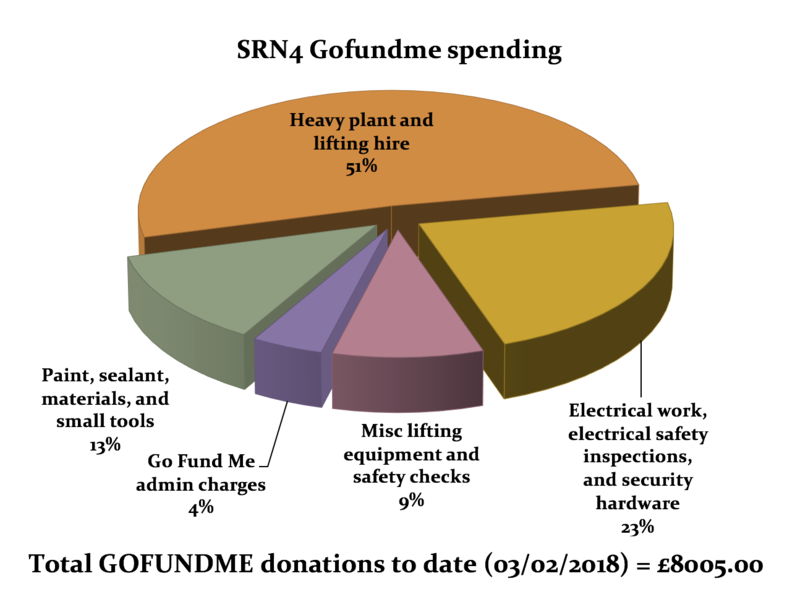 To date, we have raised £8005, which has been well spent, chiefly on putting on new propellers from a donor craft, roof repairs, electrical work and painting. The craft is 49 years old in 2018 and we want to ensure she remains in good condition for future generations to enjoy. For the coming year, we will be completing a full repaint in Seaspeed livery, going back to metal where required to fix points of corrosion and working on a more permanent solution for the leaking roof which will ensure that interior components do not deteriorate any further. The museum has been on its current site for around 20 years but has never enjoyed security of tenure. This has been the main reason why major funding has never been achieved. Due to the hard work from the last two years since we opened to the public on a weekly basis, we have had a great number of happy visitors which is getting us noticed. Behind the scenes, much work is being done to ensure the future of the museum on its current site. A “2020 Vision” booklet has been created and contains our aspirations for the near future and we have been sharing these concepts with interested parties. The official word from Gosport Borough Council is that the museum’s future is secure and we will keep you updated as best we can. After many years of opening a few days a year for summer events, the museum is now able to open every Saturday (and Wednesday in the school holiday periods) with only volunteer support. We have built up a partnership with Hovertravel and some 30 special events are planned at the museum during 2018, including hovercraft pleasure trips from the “Lee” slipway and other hovercraft tours and excursions within the Solent. We have positive discussions taking place with hovercraft manufacturers to promote hovercraft to a wider audience and multiple TV crews completing productions ready for broadcast this year featuring the Hovercraft Museum. We would like to thank our small, but dedicated, team of volunteers who work tirelessly. The trustees want to place on record the enormous appreciation for the work they do and the time they give up. Finally, we would like to further extend our appreciation to all our supporters from around the world – the buzz and interest in this museum has been extremely valuable to the museum and the wider hovercraft sector.